We've had some pretty major Weekly Wii updates over the past few months, so it's about time we take it down a notch and give our Wii points a little rest, isn't it? Today sees the release of two WiiWare titles and two Virtual Console classics that we could really give or take. I suppose the multiplayer online of Tetris Party for WiiWare (1200 points) is somewhat exciting, as is the prospect of somehow controlling Tetris with your Wii Balance Board, but nothing we're in a hurry to check out. Digital Leisure brings us The Incredible Maze (500 points), another Balance Board compatible title that has you navigating...incredible mazes. Okay! On the virtual console side of things we have two TruboGrafx16 titles, futuristic boxing title Digital Champ Battle Boxing (700 points), and Gradius Gofer No Yabou (900 points), the CD-ROM sequel to the original shooter classic, and probably the most exciting game of the week as far as we're concerned. See anything you'll be picking up?Two WiiWare Games and Two Virtual Console Games Added to Wii Shop Channel No matter how many years go by, the blocks just never stop falling. 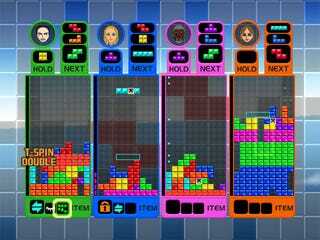 Now Tetris Party gives you the chance to show off all the block-stacking skills you have honed through the years while competing with friends in a variety of new challenges. If you’re in more of a solitary mood, see how long it takes you to work your way through The Incredible Maze. The Virtual Console also sees two classic games added. Whether you like to do your fighting with an airship or a pair of boxing gloves, you’re covered. Nintendo adds new and classic games to the Wii Shop Channel at 9 a.m. Pacific time every Monday. Wii™ owners with a high-speed Internet connection can redeem Wii Points™ to download the games. Wii Points can be purchased in the Wii Shop Channel or at retail outlets. This week’s new games are: WiiWare™ Tetris Party (Tetris Online, Inc., 1-6 players, Rated E for Everyone, 1,200 Wii Points): Tetris Party is a deceptively simple, totally addictive puzzle game that is sure to keep you and all of your friends and family entertained for hours on end. The WiiWare game features 10 never-before-seen single-player and multiplayer variations of Tetris, including Field Climber, Stage Racer, Shadow and Wii Balance Board-enabled modes (Wii Balance Board™ accessory sold with Wii Fit™). Several of the modes give users the chance to take advantage of the unique point-and-shoot capabilities of the Wii Remote™ controller. The party doesn't stop there, though. Take the Tetris fun online via Nintendo® Wi-Fi Connection, where you can play multiplayer Tetris against up to five friends at a time. You can also see how your Tetris Party skills stack up against the rest of the world using the global ranking system. The Incredible Maze (Digital Leisure Inc., 1 player, Rated E for Everyone, 500 Wii Points): Get lost in The Incredible Maze! Simply tilt your Wii Remote controller to navigate a series of exciting and twisted mazes. Entering the maze could not be easier, but finding your way out will require a keen eye and a steady hand. Obstacles and traps are around every corner, so move your ball around the maze without falling off the edge. But watch out, there are lots of surprises in store. You can hunt for gems in a timed challenge, or test your abilities in a race against the clock. The Incredible Maze is also compatible with the Wii Balance Board, so you can really put your weight into it. This is the way in, but you’ll have to find your own way out. Virtual Console Digital Champ Battle Boxing (TurboGrafx16, 1 player, Rated E10+ for Everyone 10 and Older – Mild Violence, 700 Wii Points): Set in the near future, Digital Champ Battle Boxing is a first-person-perspective boxing title that plunges players into the raw intensity of the ring! Determined to thwart Mother Computer’s plot to conquer mankind, you infiltrate the enemy’s domain, using your boxing skills to vanquish your foes. Each round is three minutes, with a total of 12 rounds to a match. Advance to the next contest through either a KO or by flattening an opponent three times in a round for a TKO. Utilize an arsenal of left and right jabs, hooks, power-charged crosses and three different kinds of “Devastator” punches. Deftly block and slip your opponent’s attacks, and look for your chance to lay them out. Master these techniques and take down the greatest opponent of them all, DIGITAL CHAMP! GRADIUS® II GOFER NO YABOU (TurboGrafx16 CD-ROM, 1 player, Rated E for Everyone – Mild Fantasy Violence, 900 Wii Points): This shooter is the sequel to the seminal masterpiece, GRADIUS. Two years after its last epic battle, the GRADIUS army recommissions the VIC VIPER super-dimensional warplane to combat the invasion of a new nemesis known as GOFER. Piloting the latest model of the VIC VIPER, players can select between multiple WEAPON MODULES and SHIELDS to tackle the varying stages and enemy attack patterns they come up against. With a total of nine stages, this perfect port of the original boasts one of the longest adventures in the series and features more of its trademark fast-paced background music to accompany the intense action.